Seriously, I have four spaghetti monsters. 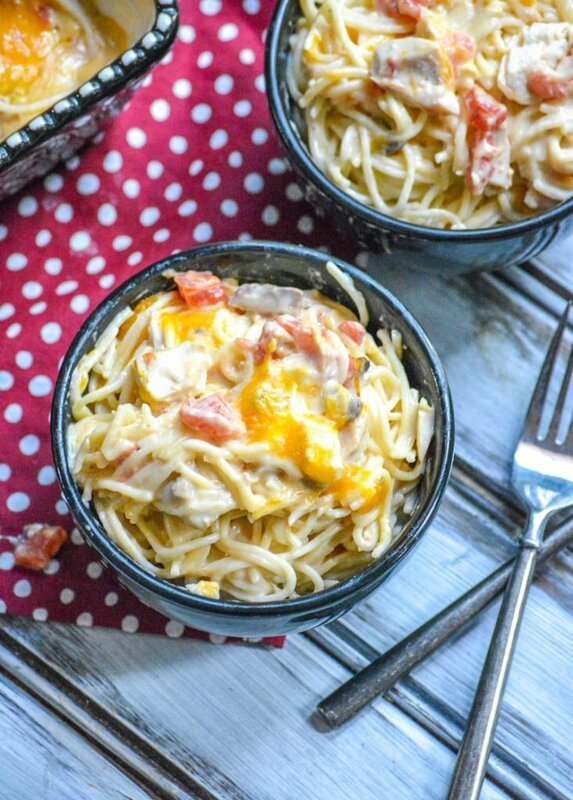 It’s a great quick, easy meal when we have a busy evening of activities ahead. Also perfect for those times when I just don’t feel like spending all day in the kitchen. They happen more often than I’d like to admit too. It’s also perfect for the evenings when my boys have dinner duty. I’m one of those mean, old school Moms whose kids love to hate her because they have these little old things called chores. One of which includes cooking dinner once a week. They can hate me now, they’re future wives will thank me. 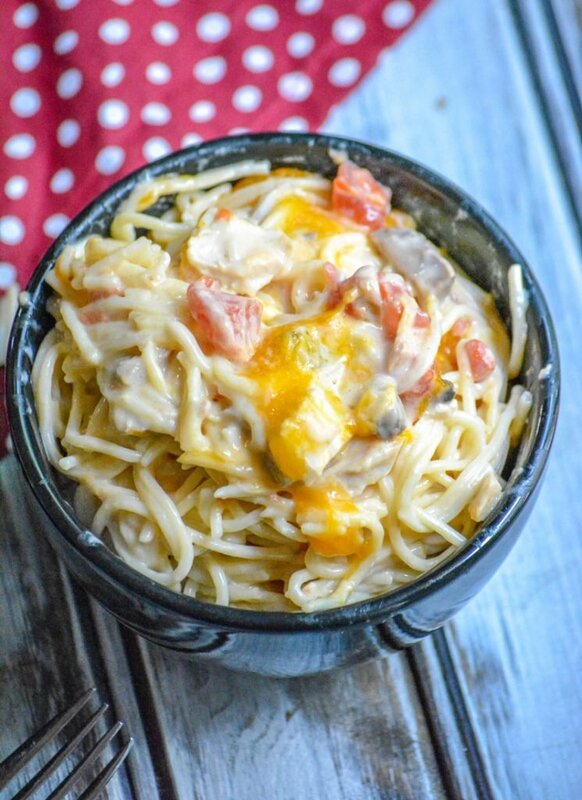 And I do try to look out for them by providing easy options- like this Cheesy Mexican Chicken Spaghetti. That being said, as I’ve mentioned before, I love finding new ways to re-do our traditional favorites. 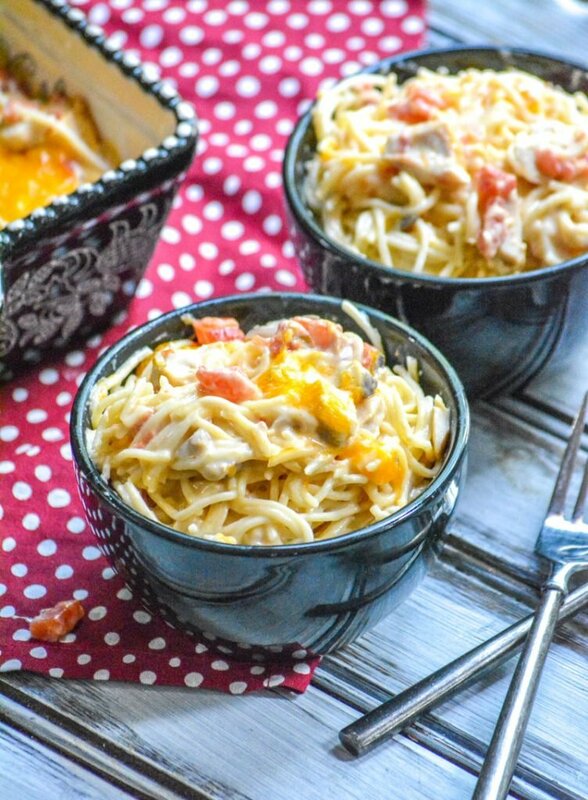 This spaghetti offered all the ease of a traditional version, but with a nice Mexican feel and a little ‘kick’. Everybody, including my husband (the pickiest of the bunch) came back for seconds. My husband may, or may not, have had three helpings. Thin spaghetti is cooked until al dente, drained, and rinsed under cold water to stop the cooking process. It’s then tossed in a creamy sauce of cream of soups, sour cream, with a little kick from Rotel tomatoes with green chilies. 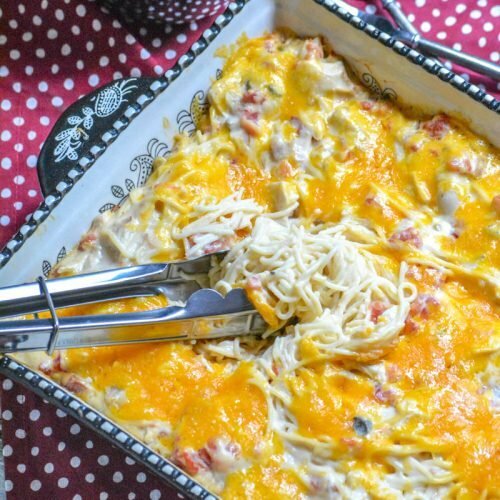 Studded with chunks of savory rotisserie it’s sprinkled with a generous helping of shredded cheese, and baked to bubbly perfection- making it an ideal casserole dinner. 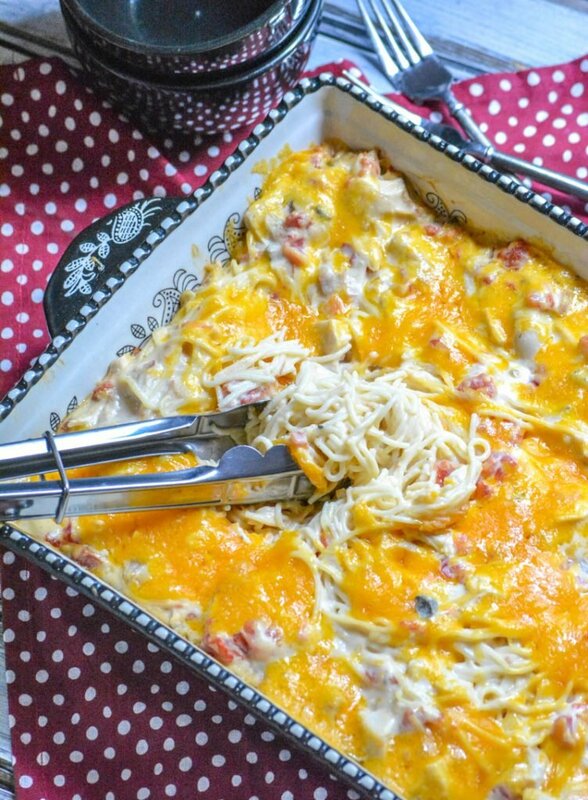 Get your family in on the action with this easy recipe for Cheesy Mexican Chicken Spaghetti. Served with a simple side salad, it’s an easy meal the whole crew can make and enjoy, together. 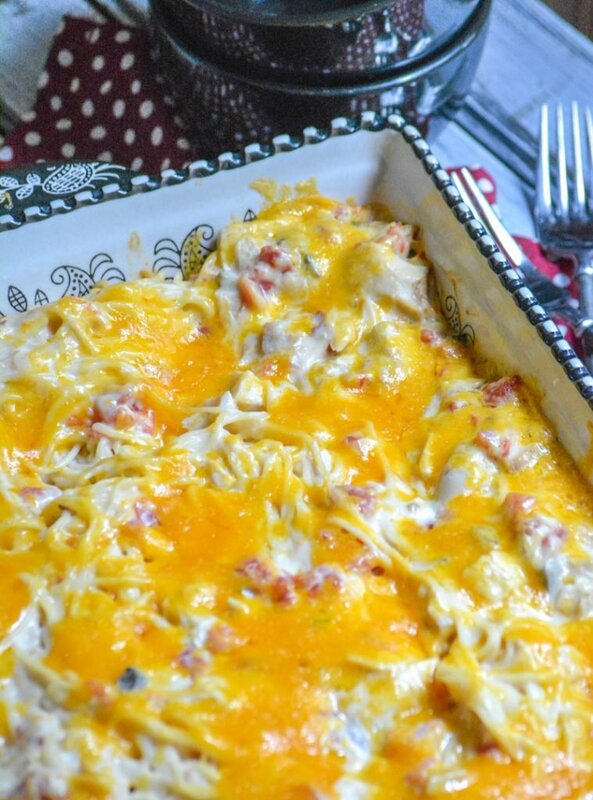 Other Mexican-style dishes you might also enjoy: One Pot Mexican Chicken & Rice (Arroz Con Pollo), Mexican Chicken Caesar Salad, Mexican Three Bean Salad, & Mexican Street Fries with Salsa Ketchup. 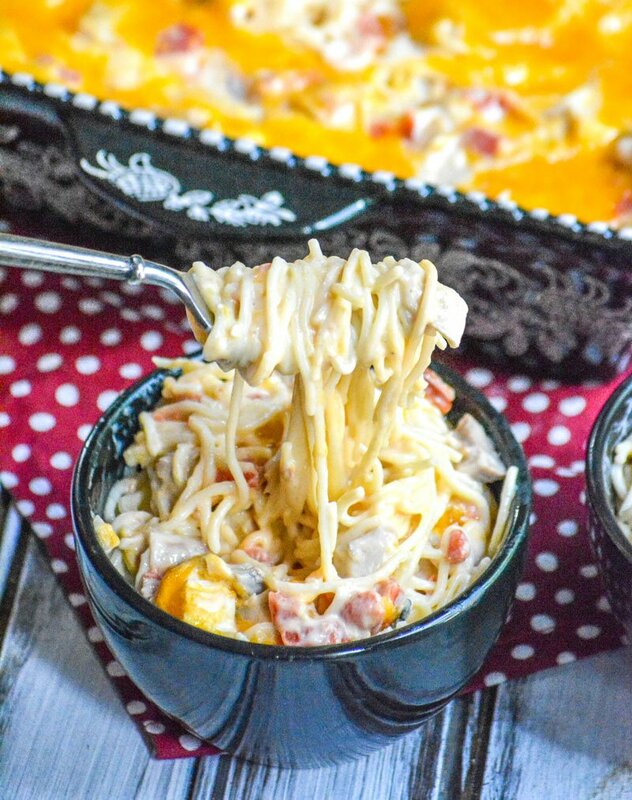 A new spin on the classic pasta dinner, this one's creamy with a Tex Mex spin, and a delicious, melty cheddar cheese topping. This looks incredibly delicious. Can I hire you as my personal chef? lol. I wouldn’t recommend it because the cheesy sauce doesn’t thaw well.